ICSA CONDEMNS SUGGESTED CUT TO FARM PAYMENTS. FSAI call for more action on Campylobacter. Of all infectious diseases which must be notified to health authorities in Ireland, one of the most frequently reported is Campylobacter infection, surpassing influenza and some hospital acquired infections, states the Chief Executive of the Food Safety Authority, Alan Reilly, writing in FSAI News. Describing it as Ireland’s number one cause of foodborne illness, Professor Reilly states that “so far this year almost 2,500 cases have been identified, ten times more than those caused by Salmonella. Given that actual cases far exceed reported cases, we estimate that there could be as many as 25,000 cases of campylobacteriosis annually in Ireland. The number is steadily rising year after year. “Campylobacterosis is a nasty infection, which typically lasts a week. Summer is the peak period, with children under four the group most affected. Sufferers develop diarrhoea or bloody diarrhoea, and often develop severe cramping and abdominal pain, coupled with fever, within two to five days after exposure to the organism. Nausea and vomiting are also common. Although complications are rare, infection is associated with reactive arthritis, Reiter’s syndrome or Haemolytic Uremic Syndrome (HUS). Approximately one in 1,000 cases leads to a neurological disorder called Guillain-Barré Syndrome. “The organism does not grow in food, but food is the most common source, with poultry the primary reservoir. A very low dose is enough to cause illness. Even one drop of juice from raw chicken meat can contain enough Campylobacter to make a person ill. Results from the most recent FSAI survey of Campylobacter in retail chicken shows that about 50% of products harbour the bacteria. Cooking easily destroys it, but cross-contamination from raw poultry is how it manages to infect so many of us. It might be argued, therefore, that good hygiene practices in the home or the catering sector should be enough to provide protection. However, this alone has not proven enough, as evidenced by the increase in reported cases year-on-year. It is equally valid to argue that elimination of Campylobacter from poultry would be a far more successful strategy. Clearly consumer behaviour in the home cannot be the sole means of prevention. slaughter plant operators and retailers, as well as consumers. awareness of the danger of cross-contamination. The industry, however, needs to do more. “Flocks should be systematically tested for Campylobacter before they are presented for slaughter. These results need to be communicated back to producers. How can poultry producers improve the biosecurity needed to keep Campylobacter out of poultry houses unless they know the Campylobacter status of their flocks? Processors and retailers should come together to fund this testing programme as the burden cannot be borne by the producer alone. It is also time to incentivise change and for retailers to pay bonuses for Campylobacter-free flocks as they do elsewhere in Europe. This will drive improvement and reward those who are serious about keeping Campylobacter out of their flocks. Little will happen without some sort of financial incentive, and vital and immediate changes are necessary to combat Campylobacter infection. slaughter, as recommended in the 2011 FSAI report. This will set a target for the improvement of slaughter hygiene. 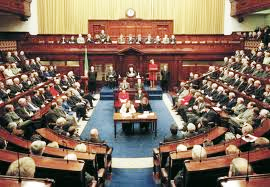 Oireachtas members lobby President Higgins not to sign into law the Water Services Bill. sign into law the Water Services Bill. 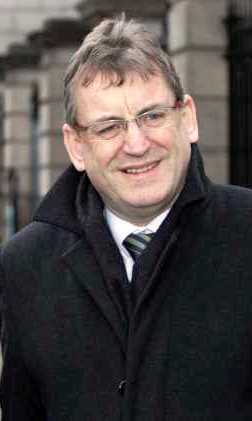 “Having clarified with the Office of the President that a joint petition under Article 27 of the Constitution would be out of order as both Houses of the Oireachtas have now passed the bill, Sinn Féin, the Technical Group and some other Independents are now asking that the President invokes Article 26 and exercises his powers within the Constitution. “We have written to the President and asked him to do just that. “The will of the people has been clearly illustrated on this issue with thousands demonstrating outside Leinster House on 10th December. However, the Fine Gael and Labour coalition used its majority in the Oireachtas to force this Bill through against the clear wishes of the people. of such national importance that the will of the people thereon ought to be ascertained. of referendum or by holding of a general election before such charges are introduced. 2. The proposed plebiscite on the ownership of Irish Water in section 2 of the Bill does not satisfy demands for a constitutional referendum to enshrine the public ownership of Irish Water into the Constitution. 3. The proposal in Section 3(3) of the Bill which will require households who are unable to drink the water in their taps due to contamination to pay 50% of their water charges is fundamentally unjust. Sligo Hughes Bridge works cease for Christmas Holidays. Two week break with effect from Friday 19th December. Sligo County Council has announced that works at Hughes Bridge have been been discontinued for the Christmas holiday, commencing on Friday 19 December. In a statement, the authority has said the temporary traffic management plan will continue to apply during the holiday period. “During this period also it is intended that footpaths on both side of the bridge will be available for use by pedestrians. The 2014 All Ireland Fleadh Cheoil is said to have generated €50 million in economic spin-offs for the local Sligo economy. It’s estimated 350,000 visitors were in the town during the eight day festival. Bartley Gavin of Sligo County Council is chairman of the organising committee. Sligo, which is the venue for the 2015 fleadh, is reportedly planning to bid for the 2016 festival. Sligo house fire claims life of 69 year old man. Victim found dead after fire service was called to scene. been removed to Sligo Regional Hospital.